An original letter of correspondence between brothers and business partners Joshua Coffin Chase and Sydney Octavius Chase. Topics discussed in the letter include estimates of crop balances at Isleworth Grove, upcoming shipments, and a letter from Joshua written to S. M. Crowell. 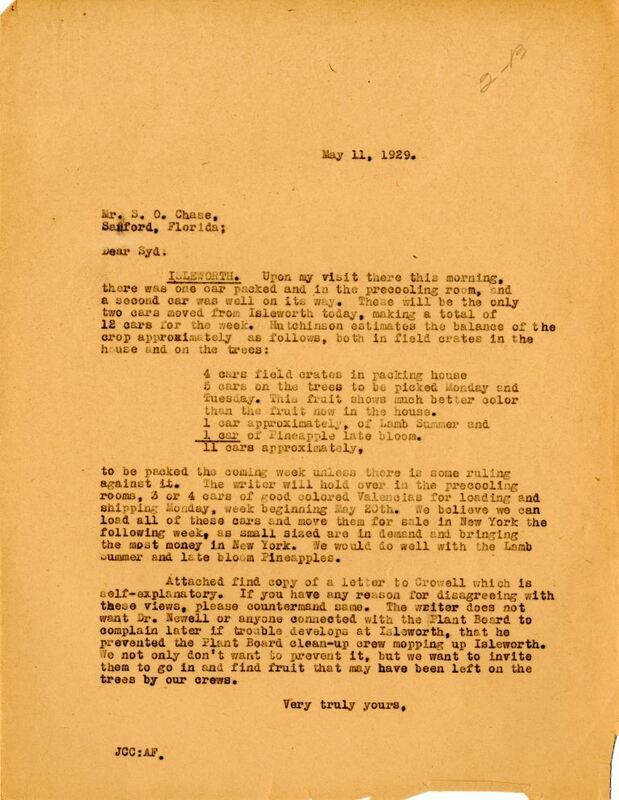 Original letter from Joshua Coffin Chase to Sydney Octavius Chase, May 11, 1929: box 49, folder 20.84, Chase Collection (MS 14), Special and Area Studies Collections, George A. Smathers Libraries, University of Florida, Gainesville, Florida. Digital reproduction of original letter from Joshua Coffin Chase to Sydney Octavius Chase, May 11, 1929. 5 cars on the trees to be picked Monday and Tuesday. This fruit shows much better color than the fruit now in the house. 1 car of Pineapple late bloom. to be packed the coming week unless there is some ruling against it. The writer will hold over in the precooling rooms, 3 or 4 cars of good colored Valencias for loading and shipping Monday, week beginning May 20th. We believe we can load all of these cars and move them for sale in New York the following week, as small sized are in demand and bringing the most money in New York. We would do well with the Lamb Summer and late bloom Pineapples. Attached find copy of a letter to Crowell which is self-explanatory. If you have any reason for disagreeing with these views, please countermand same. The writer does not want Dr. Newell or anyone connected with the Plant Board to complain later if trouble develops at Isleworth, that he prevented the Plant Board clean-up crew mopping up Isleworth. We only don't want to prevent it, be we want to invite them to go in and find fruit that may have been left on the trees by our crews. Chase, Joshua Coffin. 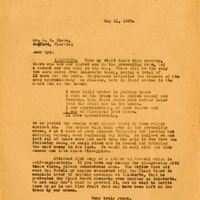 “Letter from Joshua Coffin Chase to Sydney Octavius Chase (May 11, 1929).” RICHES of Central Florida accessed April 25, 2019, https://richesmi.cah.ucf.edu/omeka/items/show/2733.